Getting your PC to the living room isn’t always easy, but it’s often worth it. With game consoles now more like a PC than ever in terms of their internal components and infrastructure, the world of PC gaming has sort of hit a new high. Microsoft is releasing pretty much all of its Xbox exclusives on PC, and even Japanese games like Code Vein and Disgaea now launch on Steam and other digital store fronts. Times are good. I’m one of those people who swears by his monster PC, but one argument that I can’t really come back against is the good old ‘comfy couch’ one – the idea that the largest benefit of consoles is being able to be a tiny, relatively quiet box under your TV that’s controlled without any of the fuss or mess that can be associated with extension cables or wireless mouse and keyboard pairing. It’s a fair criticism. Solutions to this have been cropping up all over the place, the most prominent of which is Valve’s own Steam Link. I recently got to try out another major competitor to that, however, and a strong solution for PC gaming away from a desk: The Nvidia Shield. The Nvidia Shield has been around for a while now, but the company has recently put out a new 2017 model of the device that’s slicker, smaller and genuinely significantly improved over the original model. It’s a cool-looking piece of kit and really is very dinky – and the improvement over the previous version is significant. 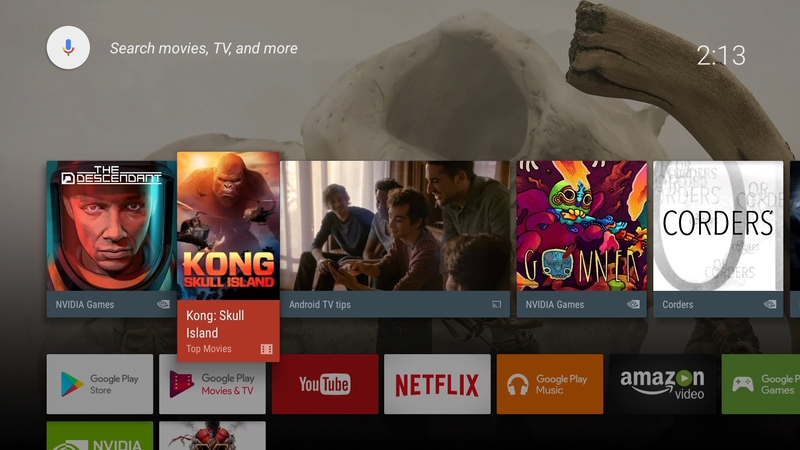 It’s smaller (think Switch sort of size) and sleeker looking, but there’s also some improved functionality. Most of you are no doubt familiar with basic streaming devices like the Amazon Fire TV sticks – and Shield is that turned up to eleven. That goes for everything – feature set, performance and cost – and included in the bargain is a solution for streaming PC games to your TV. At $199 / £189, the Shield is one of if not the most expensive video streaming players available, but it’s also one of the most powerful too – it has access to Amazon Instant Video, Netflix, Vudu, Plex and all the other obvious services, with many of them available in 4K. If you’ve gone in on that whole smart home thing the Shield is even ready to hook into all that. It’s hardly the best way of using the actually rather beefy guts of the Shield, but if you want you can play Android-based games from the Google Play store. I know you’re probably about to scoff at this, but there’s actually some decent stuff available on here. The Shield has access to a special version of the Play store with some bespoke releases. This includes stuff like The Witness, DOOM: BFG Edition, HD versions of the PS2 GTA games, Half Life 2, Portal, Soul Calibur and a slew of Square Enix RPGs including Final Fantasy 9, aka The Best One. It’s an impressive slate of games, and given most of these have been built and tweaked to optimise them for the Shield, they run well. Remember OnLive? Okay, evoking that disaster here probably isn’t the best, but Nvidia has been working for a while on a game streaming service that aims to fulfil the original promise there. It’s Netflix for games – cough up a monthly fee and you get access to a bunch of games that are ran elsewhere on beefy machines and streamed to you. If you have the bandwidth there’s some great games on this service including The Witcher 3, and if you really fall in love with a game you can buy it outright, too. The Shield has been optimised for this service, but to be honest it still leaves quite a bit to be desired. It’s ultimately early days for these services, but GeForce Now suffers the same problem similar services has: bandwidth constraints causing buffering and hitches in gameplay. I’m on a 150mbps connection and I still suffered the odd hitch here and there even on a wired connection, so while the idea is strong there’s still a way to go until this is the new standard. For less twitch-dependent games this is decent, though, especially on a strong connection. The final and most important option is much easier to get right. If you have a PC that’s compatible (2gb RAM, a decent CPU, and a GeForce GTX graphics card) you can simply hook into your PC over the local network and stream games direct from it to your PC. You can also do this via the internet, but expect to run into the same bandwidth and lag problems as GeForce Now. On the same network, however, this works like a dream. You can easily boot into Steam’s TV-ready big-picture mode with a few button presses and while not everything is compatible a good number of games are, especially in this age of very good controller support on PC. The Shield ships with its own controller, a sort of angular, deus-ex looking thing that apes Xbox controllers. I don’t think it’s as nice as an Xbox pad or Dualshock 4, but the good news is that the Shield can actually pair with those controllers too. You can also use a keyboard and mouse – bluetooth stuff will work inherently, while the dinky console also has two USB 3.0 ports. 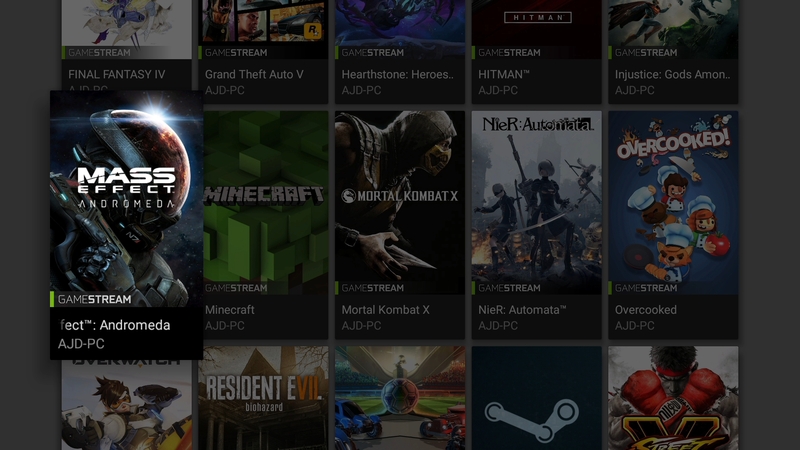 The set up process is really pretty simple – just log in to the same Nvidia accounts both on the shield and on the PC-based GeForce Experience. Once that’s done, it’ll scan and pick up the lot – EA Origin Games, Blizzard Battle.net stuff, Steam stuff, and there’s even the option to add individual apps to the line-up if anything is missing. Once I had it set up on my network (I chose wired ethernet for maximum stability, but it also naturally supports wifi) using the Shield to stream my PC games was an honest-to-goodness dream. It all just works. It’s difficult to fault, and while expensive it feels more versatile and stable than other options I’ve tried – and that’s setting aside its media features. Just be aware that over the internet or using the actual game streaming Netflix-style tech things start to look a lot less appealing. Aside from all this I’ve barely touched on the media stuff – the Shield outputs in 4K and can kick out stuff like Netflix, Amazon Video and soon Google Play Movies & TV in 4K with full HDR support. It’s a bit of a beast, though one supposes it also should be for the money involved. It’s hard to overstate how slick this feels as a media device, however. The little remote control and controller that ship with it both have mics for voice recognition, and the smart home tie-in is a clever idea, something that in the right home set up could make the Shield the center of a living room. All that power is put to good use, then, but boy… that price. It sure is something. You probably already know how much you’re willing to spend in order to get your PC gaming content streaming to your TV without an unsightly HDMI extension lead or something – and likewise for how much you’re willing to cough up for a media box. The 2017 edition of the Shield TV is the best device I’ve seen of its kind, and it’s legitimately become a staple device in my living room – it gets a lot of use. If you’ve already a PS4 or Xbox One sitting under your TV you will rightly be less tempted – but for PC-driven players, this is a curious and enticing little package.